This post it's gonna be an English post. Hopefully is it without errors. Unfortunally for these two sentence i need to help a translater. To bad. My dream is that i could talk in any languages of the world. How cool would that be?! And another reason is that sometimes i have readers all over the world. So now they can read this post. Actually i don't say annything useful. Mmm about what will i talk? This is a fact. If you can choose a dutch song or an English song. I prefer an English song. And another good thing is that (almost) everybody understand you. 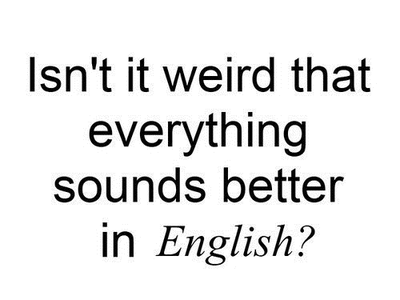 and just words are also better in English. In French i know a word but in dutch i can't directly come on a word. So in French they said ordinateur and in English they call it a computer. The word in French is awefull. Or let me say that i find that. There is a thing that not dutch people can read the source. Okay the word is different but they see that i used it from wehearit. So actually they can read one thing. Maybe i must tell you in short text about what i'm blogging. - is blogging a word? - I telle about spongebob, you know him. About what are you doing in the train, do you read, sleep, eavesdropping of conversations. Where i go with friends, what i do at school, fifty shades of gray! Yes i talk about that and i tell that you have to read the books. You can't stop reading. Fun guaranteed. Oke in the beginning it was difficult to speak English but now is it reasonable to do. I hope but i know it isn't that i wrote no errors.